1. I developed a pattern for the handles. I went through several variations of the pattern, cutting each one out of cardboard until I had one that felt just right. Click on the image of the pattern to download a PDF file and then print it out. 2. Slip a 1" pipe through a 4" stainless steel tailpiece and set the ends of the 1" pipe between two mounts. Using a hammer and center punch, pound deep dimples around the base of the tailpiece, within 3/4" from the bottom. The purpose of the 1" pipe is to prevent deformation of the tailpiece while pounding on it. The 1" pipe shown in the picture just happens to have grip material around it from a previous project. It's just what I had on hand. After pounding in the dimples, cut some slots into the flange of the tail piece using the edge of a file. 3. 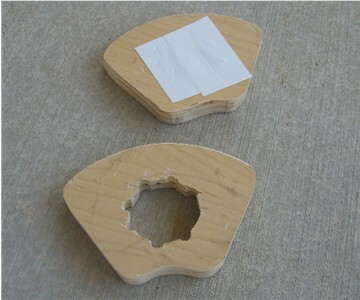 Cut out the patterns and tape them to a sheet of 3/4" plywood and trace them, including the inside hole, as shown. 4. 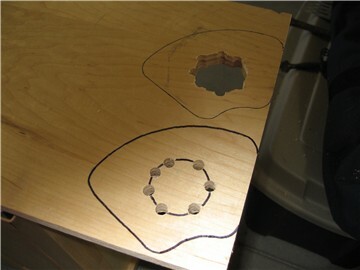 Randomly drill holes through the plywood around the inside circle. Lean the drill slightly one way and another for each hole so that they are drilled through at different angles. 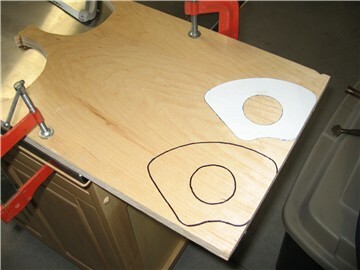 After drilling, cut out the inside holes with a jig saw. After that, drill a few small holes into the inside surfaces around the insides of the holes. This is all meant to keep the casting resin firmly in place. 5. Using a jig saw, cut out the handles. Using a file and sandpaper, smooth out the outer sides. Round out the edges a bit where you will be placing your fingers. Completely cover the holes on what will be the outsides of the handles with tape, or anything that will adhere to the wood and will contain the casting resin when poured. I happened to use two strips of white duct tape over each hole. If you're overlapping tape, make sure that one is adhered fully to the other. 6. 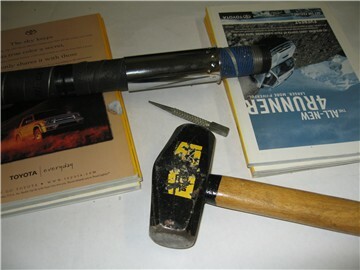 Place your handles on a surface with the taped ends down on the surface. 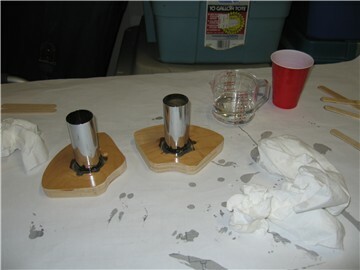 Fill the holes up to about just below the rims with casting resin. You want to account for displacement when you place the tailpieces into the holes. 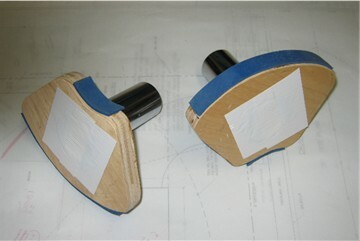 Place your tailpieces into the holes of the handles, sitting on the tape below. Once the tailpieces are seated, allow the resin to settle for a bit and then carefully add some more, if needed. If there is any spill over, grab a mixing stick and push the resin towards the hole with the side of the stick - like a squeegy. If any resin gets on the upper ends of the tailpieces, wrap a paper towel around your finger and wipe downwards to remove it. Once the casting resin is poured, don't move the handles. Don't touch them for 24 hours. After that, if you want to move them to another place until the curing process is complete, don't pick them up by the tailpieces. Get under the handles and carefully carry them like that. AND NOW FOR THE KILLER PART.......THE WAIT! The Casting Resin I got says that the resin is cured after 72 hours. I wanted to be absolutely sure that the resin was rock hard and didn't attempt to finish my Aikido Grip until at least 72 hours after the resin had been poured. 8. The texture of rubber bands makes the best grip surface for this device. Get a wide rubber band and cut it to length. You can find wide rubber bands at office supply stores. I just happen to have some exercise bands I got which are next to useless when it comes to exercise, but they make great grip surfaces. I cut the bands to length and then laminated them to the finger and thumb surfaces of my Aikido Grip using super glue. 10. 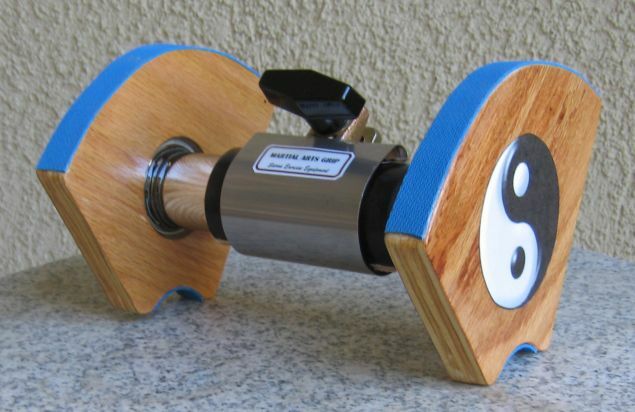 Using the picture at the top as a guide, assemble the Aikido Grip.